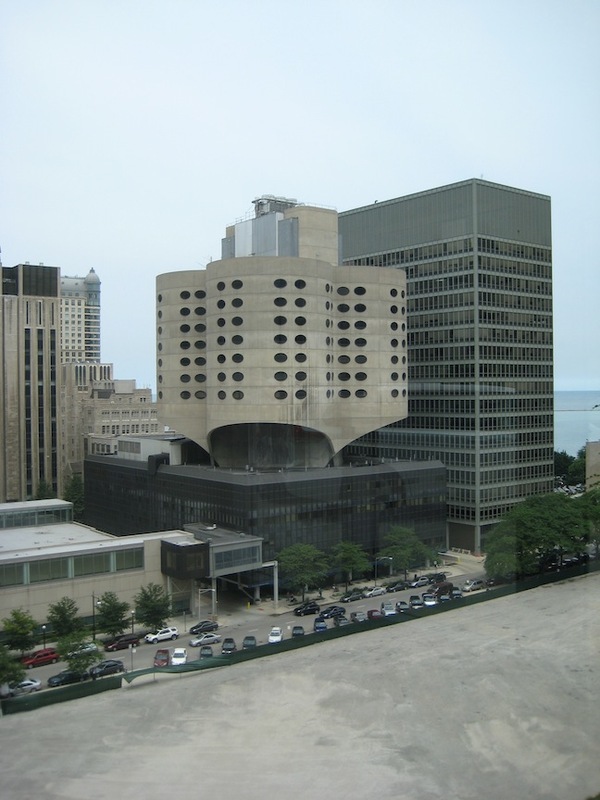 The raised temperature regarding the inevitable demise of one of Bertrand Goldberg’s contributions to Chicago, the former Prentice Women’s Hospital building, clarifies something problematic with Chicago today. This city is far from the haven of architectural health it proudly considers itself to be. In any thriving urban ecosystem the removal of premier architecture would cause some grief, but since there would most certainly be future replacements of considerable charm and character, as well as plenty remaining beloved buildings, the pain would seem to be temporary, mild and hardly worth creating a fuss over. In reality, Chicago is far from a city of design futures, and for some time now has long been populated with mostly marginal efforts and lame buildings. With so few significant new projects over the past twenty years that one can name them all with little difficulty. Try it! It’s frustratingly simple. Despite a Cook County judge’s order granting temporary landmark status to the structure late last year, on February 7 the Commission on Chicago Landmarks confirmed its decision not to preserve Goldberg’s architectural gem by voting again to reject preliminary landmark status for the landmark building. The National Trust for Historic Preservation and Landmarks Illinois removed its lawsuit, liberating Northwestern University to demolish the building now, while labor is cheap, and land-bank the plot for when they finally have a plan for a proposed biomedical research facility. The past few decades have not been kind to the large concrete institutional projects of the 1960s-70s in America, having already seen the demise of many a Paul Rudolph or Marcel Brauer building. Still too recent to be considered historic by most people, but too old to have any ability to excite majorities, this generation of architecture is caught in the gap between contemporary and historic public interest that leaves it open for erasure. The strange hostility to the architectural recent-past of this country in pursuit of an anonymous near-future is baffling, but not surprising for a country so openly conflicted by how we embrace progress while recognizing our histories. Prentice should stay. Its near-death existence is symptomatic of a deeper illness when one project means so much for a city’s sense of design health. Making things more difficult, arguments of its value to the city seem to increasingly be made exclusively on monetary measures and nothing else—no doubt one way to measure worth, albeit the most philistine. What is part of the debate is the issue of whether or not the public has a right to prohibit the demolition of a private university’s private property. Certainly things like tax breaks, city zoning and building code rewrites in order to accommodate the wishes of Northwestern University, and other expected procedures, complicate the categorization of Prentice and Northwestern as fully private or public enough to warrant our expectations of preservation. Nevertheless, this reality is already part of the public conversation, as evidenced by the expectations of superlative design from the whenever-it-would happen new project to sit on the whenever-it-does happen cleared property. But, if there’s doubt that the public has the ability to hold off Northwestern’s demolition dreams, and if the flood of promised construction jobs is enough to convince city officials otherwise, it’s pretty naive to assume that any public influence will exist on the replacement project’s design ambitions. Which is too bad, because whether or not one works on the new project, or works at the project, or will be cared for in the project, all of us will have to look at it, live with it, and recognize it as part of who we are, even if it’s not owned by us. If only the people of Chicago had some way to unquestionably be able to influence expectations of design quality on the construction projects that surround us, this particular (expected) loss might not feel as depressing. Designs approved by the public via the Public Building Commission: Albany Park Branch Library and the Ping Tom Memorial Park Fieldhouse. Fortunately, and maybe surprisingly, the public does have the power to influence the new design. In 1956, the city established the Public Building Commission of Chicago to oversee the design and construction of facilities built with public funds. The design of all the libraries, fire stations, police stations, public schools, park buildings, parks and more are overseen by this agency. Most of these projects are almost entirely forgettable and completely absent of significant works of architecture. For a commission responsible for the oversight of our public-built environment, this is pretty embarrassing. The PBC (and the public) have decided that design is a nice thing to have if there’s time or funds or whatever after every other possible integer of a building has been accounted for. The results are lumps of material littered around the city that everyone has invested in and paid for and couldn’t care less about looking at. Designs approved by the public via the Public Building Commission: Nathan Hale Elementary School Annex and the Edgewater Branch Library. At the same time that our city’s architecture goes without any interrogation, complaints—or public regrets—groups are loudly lamenting the same preference for bland buildings that demote design from a private institution. This is more than odd. If our city cares about design, then it cares about design, and that means that it expects its public product to be of the high standards of visual and organizational interest and curiosity we so comfortably seem able to expect of others. But we don’t. Prentice is going to hurt, but not because we are about to lose one of the world’s most novel projects, and not because that loss will reduce the proud stature of Chicago as an architectural capital of the world. Prentice is going to hurt because its loss clarifies that this city is already a philistine capital that expects a few private individuals to spend for architectural significance, and we’re too lazy to care for it ourselves. If we did care, we could commission work of significance and maybe the loss of a single building wouldn’t feel like the transformation of a city into a town. Paul Preissner is an architect and assistant professor at the University of Illinois at Chicago.